Task Manager, Regedit and Folder Options Disabled by Virus? If You think that it’s easy to fix this problem by going to Registry Editor, you can’t! You'll get a error message “Registry editing has been disabled by your administrator”. Folder Options and even Show Hidden Files & Folder is disabled! How frustrating! Don’t worry, here’s how to restore your Windows Task Manager, Registry Editor, Folder Options and Show hidden files & folders. Brontok virus will make some changes to the system restrictions in order to hide itself from easy detection and also from easy cleaning. 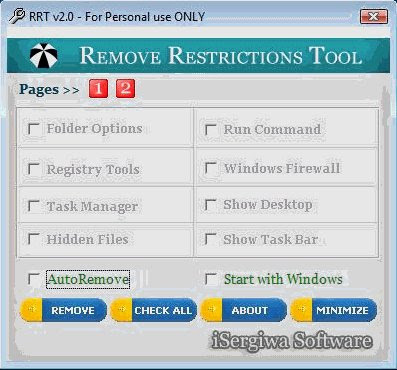 Here’s a free tool called Remove Restrictions Tool (RRT) which is able to re-enables all what the virus had previously disabled, and gives you back the control over your own computer. Small and easy to use. Make sure you boot in to Safe Mode to use Remove Restrictions Tool (RRT).